Kurt Busch starts on pole for Sunday’s Cup race at Texas (Matt Sullivan/Getty Images North America photo). FORT WORTH, Tex. 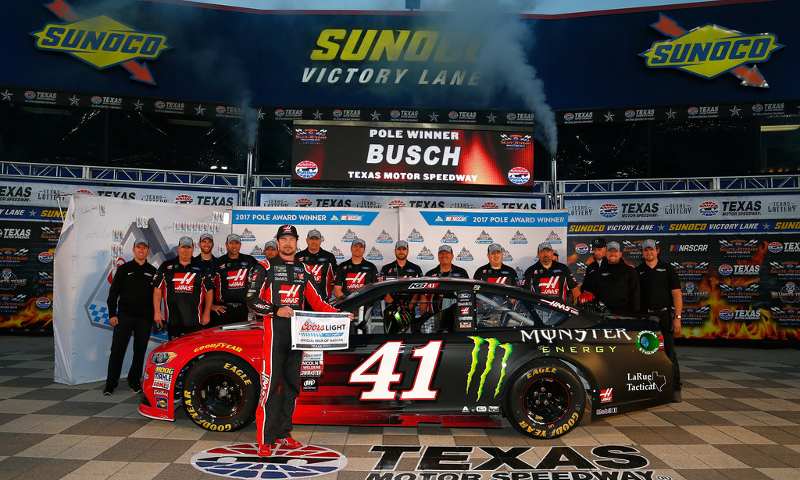 — Kurt Busch gave crew chief Tony Gibson a great birthday present Friday evening when he won the pole for Sunday’s Monster Energy NASCAR Cup Series race at Texas Motor Speedway. Busch broke boss-man Tony Stewart’s old track qualifying record at 26.877 seconds (200.915 mph) in turning the fastest lap ever on a 1.5-mile track. The 2004 Cup champ scored his first Coors Light pole of 2017 and first in 66 races since winning the pole at hometown track Las Vegas Motor Speedway last March. Denny Hamlin (200.617 mph) held the top spot in the final round of qualifying until Busch knocked him off the pole in the final minutes, with the top-five qualifiers all eclipsing 200 mph. Hamlin gained a lot of time in Turns 1 and 2 on his laps, but still lacked speed in 3 and 4. Hamlin comes into Texas after late-race contact with Chase Elliott last week at Martinsville and was the highest-qualifier among the eight playoff drivers. The Joe Gibbs Racing driver was followed by another title contender in Kevin Harvick (third) who was fastest in the first round of Coors Light Pole qualifying. Erik Jones (fourth) was fastest in round two of qualifying as Martinsville winner Kyle Busch (200.252 mph) completed the top-five. Daniel Suarez slotted in sixth, followed by Martin Truex Jr. and Ryan Blaney. Truex won the last time out at a 1.5-mile track at Kansas and looks on adding to his six wins on those types of tracks. Jimmie Johnson and Brad Keselowski rounded out the rest of the top-10 for Sunday’s AAA Texas 500. Seven cars failed to post a time after not getting through pre-qualifying inspection, which included playoff driver Chase Elliott. Matt Kenseth and Joey Logano were other notables unable to make it on track during the qualifying session. XFINITY Series driver Daniel Hemric qualified the No. 27 Menards Chevrolet while Paul Menard and wife Jennifer welcomed their second child Friday.